Just an super quick post this Friday morning because I am here in Austin, Texas and plan on making the absolute most of it! Obviously this photo was taken back in the city where sweaters are still necessary. Here I am in my hotel planning my outfit that will most likely include cut-off shorts, a simple tee, and stomping boots. Can't wait to share with you all my SXSW adventures! Such a cute outfit! So jealous that you are at SXSW, can't wait to see the pictures! That bright red sweater really pops! It's a beautiful bright cheery colour, looks wonderfully thick and watm (it was close to freezing last night where I am). I like the big pretty buttons, the large convenient pockets and cable knit. Your lipstick is a pretty red too. Have a great time in Austin! Love the bright red colour! So jealous of you right now! Wish I were in Austin. Can't wait for your Austin Adventures posts! Have fun! Seriously missing the warm weather... these cold NYC days aren't giving us a break right?! Anyway, I loooove striped shirts and red accents!! I guess I'll get back to uploading a new post on my blog!! Those glasses are so cute! Super laidback and vintage. What adorable loafers too. perfect outfit, as always, love the stripes and the red! Soooo cute! love the textures! Ahhhhh! So cute, Bonnie <3 I envy your closet (and frankly, hair!). Have a lovely weekend. Can't wait to see your SZSW fashion! Austin - sounds like fun. Wish I could go. Cute outfit. Yes, very French chic. A timeless combination of colours! Just found your blog and I love your unique style. Beautiful photos! I'm your newest follower. I really love your outfit...very inspirational... nice coat , is from wool i guesss.. I looove the combination of black & white & red!! Well done! Your outfit is so great! I really love this look! (: super adorable. So perfect - red suits you! 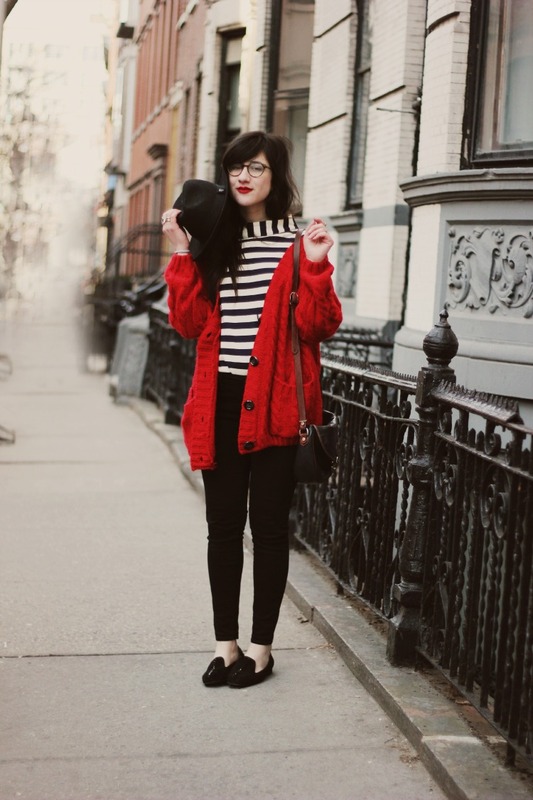 i LOVE so much your taste and your personal style :) one of the best blogger ever! Nice to see you wearing your glasses again! I really like that red sweater, it seems so warm and cozy! j'adore ton look, particulièrement la veste rouge!! !